The Link Method is the first advanced memory tool available to you once you understand the concept of substitute words + visual association. Recall that association/substitute words means creating memorable images that represent the concepts you want to remember. The "Link" is a way to quickly connect items in memory that may not be related, such as items in a lists or reading material. This method is called the "Link" because you use it to connect information in your mind with links, as the links in a chain. Several of the most-effective memory techniques, including the Link method, make use of a method called the Visualization & Association technique. Visualization & Association is a way to change abstract facts into mental pictures that are easy to remember. This works because most people's brains can remember visual images (pictures) much easier than abstract information. That's why you can usually visualize in your mind a certain place you may have visited even if you can't remember the name of the place. First imagine a silly, memorable image that represents the type of list you want to remember. Also include in this image the first item on the list (see below for example). This image is your header for the list. Think of another silly, memorable image that links the first item on the list to the second item. Think of a new image that links the second item to the third item. Think of an image that links the third item to the fourth item. Continue in this way, creating mental images for the remaining items in the list. If you've never tried the Link method, it may seem like a strange way to memorize a list. Trust me, though. Give the method a try the while playing the shopping list memory game or the next time you have a list you want to memorize. You'll see just how effective the Link method is! Below I explain how to use the Link method to memorize a shopping list. For another great example, check out how I used this method to memorize a toast. Let's begin by creating a mental image that includes the type of list (grocery list) connected to the first item on the list (6 red apples). Since this is a grocery shopping list, I imagine a normal metal trolley (shopping cart) that you might find at any grocery store. Now, to make the image memorable, I picture six red apples smashed onto the wires of the trolley or shopping cart. Your brain remembers the unusual, not the ordinary. It also remembers vivid pictures better than dull scenes. So make your mental images as crazy and clear as you can! Imagine the apple juice running down the cart. Really see the bright red color of the apples. The second item on the shopping list memory game list is a Large Loaf of Bread. Let's think of a memorable image that connects our first item, 6 red apples, to the second item. Mental images that include action are also more memorable. So I'll imagine a rain of red apples smashing down on a large loaf of bread. Making the objects in your images very large also makes them more memorable. So imagine that the loaf of bread is gigantic, as big as a house. Before going further, let's review what's happening. We know that we need to remember the items on a grocery shopping list, and the first item on our list is 6 red apples. So we created a silly mental image that connects the concept of "grocery shopping list" with "6 red apples"
We then created a second image that connects the first item on our list, 6 red apples, with the second item, a large loaf of bread. All we need to do now is to continue in this manner through the rest of the list. Follow along with me to the end. I promise you'll see just how powerful this technique is! The third item on the list is a carton of milk. We need to create a mental image that links carton of milk with the second item, large loaf of bread. An image that comes to my mind is a giant carton of milk kicking a large loaf of bread like a football. You could even imagine an entire team of milk cartons running down the field kicking the loaf of bread, like a soccer match or an American football game. Picture this clearly in your mind. IMPORTANT: the more bizarre the image, the easier it will be to remember. Your mental images don't need to look like mine, by the way. They don't need to look like the pictures on this page. What they do need to be is very memorable for you. So as you go through this example, modify and change the images however you want, such as making the objects bigger, more colorful, more detailed, etc. 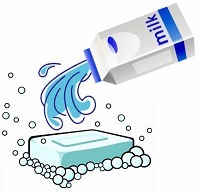 4th Link: Milk pouring out of a carton turns into white foamy soap! Next in the list is a bar of foamy soap. We need to link that to the previous item, a carton of milk. The link I thought of is an image of milk pouring from a carton. But instead of milk, foamy soap is coming out! Yuck, I wouldn't want to drink that. Notice that while the individual items in my images are somewhat normal (apples, milk carton, soap), the combinations are definitely not normal. Again, it's the very odd images that your brain can't forget. The idea is that when we recall the milk/bread image from link 3 above, our next image should connect that milk to the fourth image. In other words, each image connects (literally, provides a "link") to the next image. The fifth item on the shopping list is a pair of yellow socks. 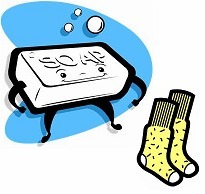 So we need an image that includes both the yellow socks and the foamy soap from our fourth link above. How about an image of washing yellow socks in foamy soap? No, that wouldn't work, because washing socks in soap is not unusual. We need a very strange, bizarre image. So I imagined a giant "Soap Man" putting on a pair of yellow socks. Why? Maybe he doesn't want his feet to get dirty. At this point, you may be thinking that creating all these images is a strange and uncomfortable thing to do. And doesn't it waste time? Like with any skill, once you practice it a few times it goes very quickly. Think about how much time you would waste repeating the list over and over instead. With the Link method, you can go through the list just once, and not forget it! The final item in our list is a packet of chocolate biscuits. 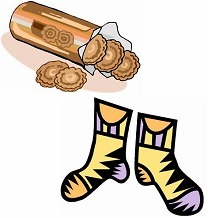 By now you should realize that we need to create a memorable mental image that connects the biscuits to a pair of yellow socks. For this, I thought of an image of myself pouring a bag of chocolate biscuits into my socks. Then I put on the socks and start walking around. Ouch, that hurts my feet as I walk on broken biscuits! The chocolate biscuits are the sixth and last item on the shopping list. Now it's time to see how we use the mental images we created to actually recall the list. Okay, so we've created mental images for each item as a memory aid. As I've said, this is known as the Link method. It's one of the most powerful memory techniques, and very easy to use. Now you've arrived at the grocery store. What were those items on your shopping list? First, you know this is a grocery list, which reminds you of a trolley or shopping cart. 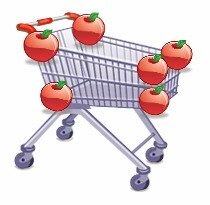 Thinking of the cart reminds you of your first image, six red apples smashed onto the wires of the cart. So you find the apples on the shelf, and place them in the cart. If you clearly imagined the images as you created them, the next picture should quickly pop into your mind. The apples smashed onto the trolley make you think of the apples raining down from the sky. And what are they raining on? 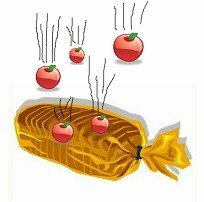 A large loaf of bread, which is being crushed by the falling apples. So you find the large load of bread on the shelf, and place it in your basket. You proceed through the list in the same manner. The apples falling on the bread remind you of the giant milk carton kicking a loaf of bread like a football. 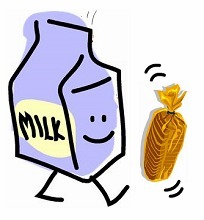 The giant milk carton reminds you of the pouring milk that turns into foamy soap. The soap reminds you of the Soap Man putting on his yellow socks. And the socks remind you of the chocolate biscuits in your own socks which are making walking very uncomfortable! Even if you spot something on the shelf that is out of order from your list, you will still recognize it as being on the list, and you can put it in your basket right then. Before you know it, you've recalled every item on the shopping list. But it's even better than that. As long as your images are clear, there is no way you can make a mistake. You will remember the list for days, even if you don't practice it. And, because the images are what you make them, the Link method can be used an infinite number of times, for any number of different lists. Give the Link method a try! For practice, use it as you work through each level of the Trolley Dash shopping list memory game. Then, start using it in your everyday life. Memory techniques do work, but only if you practice them until they're habits. Practice the Link method and other memory skills until they are second nature. If you do, you will amaze everyone with your incredible memory. It takes a little while to explain the Link Method in words. What you will find with practice, however, is that the process of forming the images starts to come easily, naturally, and quickly. You may be able to see at this point that using the Link Method can even be fun. Compare this method to simply repeating the list over and over to memorize it. Not only is that not fun, it is actually incredibly boring. In addition, your retention of the list will be much better with the Link Method compared to rote memorization, because of the use of visualization. This has been proven by numerous research studies on memory.